The FBI was terrified of the Black Panther Party, and a new name making noise within the organization was Illinois-native Fred Hampton. Intelligent, charismatic and efficient, Hampton became the leader of the party's Chicago chapter, and FBI chief J. Edgar Hoover feared that through the potential merger of Chicago street gangs with the Black Panther Party, Hampton would create a radical faction powerful enough to overthrow the government. After keeping a file on him for two years, the FBI and Cook County State's Attorney Edward Hanrahan organized a raid of Hampton's apartment on the morning of December 4, 1969. Armed with a warrant for illegal weapons possession, officers killed Peoria chapter president Mark Clark and Hampton, who was asleep in bed alongside his pregnant girlfriend, Debra Johnson. Though police claimed they were attacked by the "violent" Panthers, just one of the 90+ bullets fired in the apartment came from a Black Panther Weapon—a reflexive reaction by Clark as he was shot by officers. 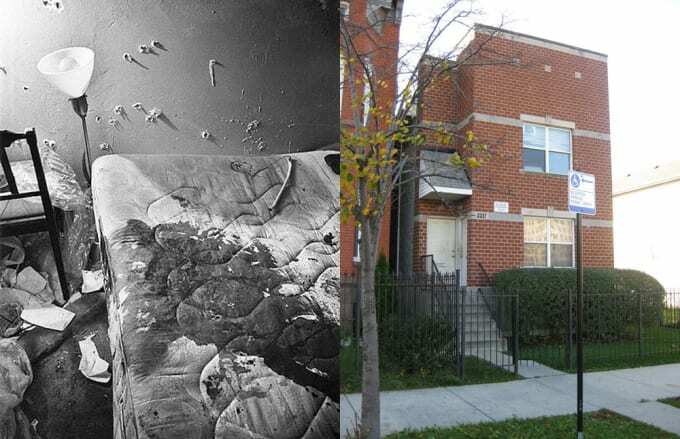 Today, the apartment where Hampton and Clark were killed is still in good condition, experiencing renovations since 1969. The neighborhood is vastly different than it was 42 years ago. Inside of the apartment building, a sign next to the door of Hampton's apartment reads "No Soliciting, No Loitering, No Trespassing – Violators Will Be Prosecuted." Hip-hop has taken notice of Hampton's work and assassination: Jay-Z, on the Throne track "Murder to Excellence" reflects on being born on the day Hampton died.